In modern law, the seizure of a debtor's property in a jurisdiction within which the debtor himself can not be found, he having absconded, or residing elsewhere. Such a proceeding has grown up in most countries under the necessities of trade, in spite of the principle that no one should be condemned unheard. 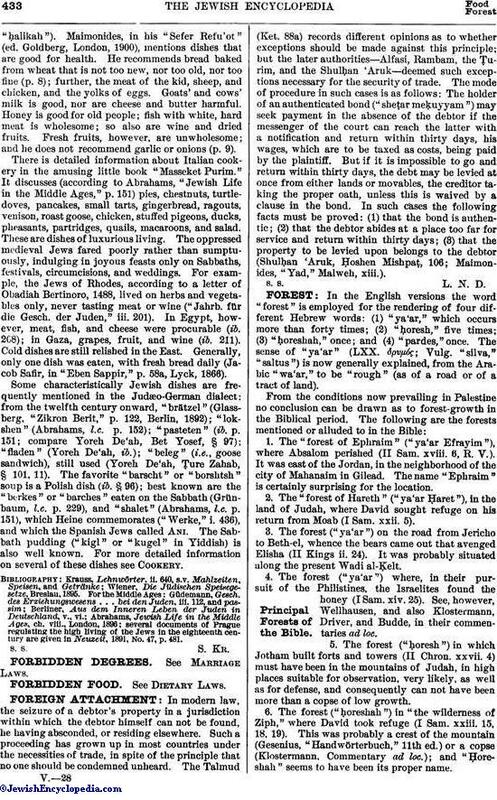 The Talmud (Ket. 88a) records different opinions as to whether exceptions should be made against this principle; but the later authorities—Alfasi, Rambam, the Ṭurim, and the Shulḥan 'Aruk—deemed such exceptions necessary for the security of trade. The mode of procedure in such cases is as follows: The holder of an authenticated bond ("sheṭar meḳuyyam") may seek payment in the absence of the debtor if the messenger of the court can reach the latter with a notification and return within thirty days, his wages, which are to be taxed as costs, being paid by the plaintiff. But if it is impossible to go and return within thirty days, the debt may be levied at once from either lands or movables, the creditor taking the proper oath, unless this is waived by a clause in the bond. In such cases the following facts must be proved: (1) that the bond is authentic; (2) that the debtor abides at a place too far for service and return within thirty days; (3) that the property to be levied upon belongs to the debtor (Shulḥan 'Aruk, Ḥoshen Mishpaṭ, 106; Maimonides, "Yad," Malweh, xiii. ).